It is definitely fall in the shadow of the Winds. We've had two snowfalls in the valley and after a dry late summer and September, we're feeling refreshed again. Most of the streams in the Lander area are a bit low to fish really effectively and the browns are looking for their redds. The Wind in the Dubois area is just right when we're not getting runoff out of the Badlands. The Bighorn at Thermopolis should be coming into prime shape for fall Baetis. Should is the operating word. The Bighorn has been about as poor as it ever has the past year. There are fewer fish but they are way big. We have been seeing scads of Psuedo's (that's just a really tiny mayfly) and have had some results on the surface. We always hope for a really good fall of Baetis fishing and they should be starting any day (they are distinctly larger than the Psuedos). Nonetheless, any day fishing is a joy. 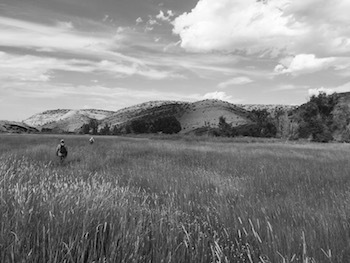 There's a nice article on Tenkara fishing in the July Wyoming Wildlife. Read it here. 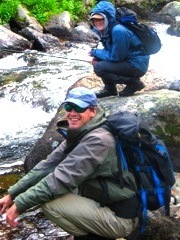 We have been enjoying using Tenkara in both the streams around Lander and the small streams in the mountains. It is very effective. The learning curve is small and the results are very satisfying. The mountain season has begun and it is full of mosquitos, flowers and great fishing. Our snowpack was heavy and runoff has been long. Everything is prime in the high Wind Rivers. Hank is just back from our first golden trout journey. The lowland streams are just coming into shape with the exception of the Sweetwater, which is almost too low. We've had hot weather and plenty of rain. If our fields are any indication, it will be a banner hopper season. We are still waiting for the Bighorn to drop to a good level. It is now running at 3500 CFS and should drop to 2500 soon. The upper Wind River should be clearing and fishable within a week or so. Mothers Day in Wyoming! Hope you're out there fishing with her. Everything here is converging (happening at the same time). The flowers are out, trees are leafing, hummingbirds have arrived, asparagus is jumping, run-off has started. And it is beautiful! The Bureau of Recreation has dropped the flows out of Boysen to about 2350 CFS (they had it up as high as 3500), which makes us think the flow will be stable. We have started catching fish on the surface. Had a fun day on the "Flock Shoot" Hole.....so many heads coming up you can even flock shoot. The snow pack in the Winds has dropped to around normal, but the southern part of the range is below normal. That means that the runoff would be short and that fly fishing may be at its peak in some of these streams at the end of June. We have some trips that could still use a few adventurous souls, even at the last minute. Looking forward to a wonderful season! It's spring in Wyoming. How do we know? The usual: snow melting, the hint of green, the usual first birds. And Hank is going fishing (see photo: fish caught within a few miles of town). We've had a long and wonderful winter. We didn't go anywhere, but it was still wonderful. Yes, there has been snow. Winds are at 118%. Not like the Armagedon of last year, but boding well for our small streams. We have a period here before the water really rises that is fun and productive fishing (but who know how long it will last). The Bighorn is already flowing at 2500 CFS (it was at 1200 all winter, the highest we can remember). We can't tell if we'll have much of a baetis hatch. Last year it didn't materialize with a similar flow. So, we accept the days as they come. Go fishing when it's not windy or snowing. Every day is a blessing! It seems like it has been a very busy season. Jim and Hank have been in the mountains and we have all been doing plenty of day guiding. The fall has been very interesting. By and large the fishing has been very steady, although the flows in the Bighorn have not been steady. We've had a bunch of fall moisture which means our local streams have been in fine order and fishing has been very productive. The Bighorn has also been good, but the flows have fluctuated from 2200 CFS down to 800 CFS for a month and now they are back up to 2500 CFS. We had been finding good rising pods, except for the last week. We are hoping that the bugs and fish will stabilize and we will get back to seeing lots of heads. We should never complain about too much water! Here's to beautiful weather, fine comraderie, and a few fish as a bonus! It has been a very busy summer so far. Hank has been consistently in the mountains, and even with a memorable snowpack he has pulled off some awesome trips. Jim Ferguson has also been full throttle. Our August is more relaxed. We do have one trip Aug. 18-24 (during the Eclipse) that could use some more people. There is still plenty of snow left (Hank and his horse support just had to shovel snow to get the horses over a high ridge). Lowland streams are just coming into prime condition and the Bighorn has finally dropped to a fishable level (2500 CFS). It flowed 9000 for an entire month. Who knows what changes that brought? There will be plenty. Paula and I had a chance to kick back and visit Iceland in July. What memorable terrain! March 30, 2017 Spring is here! We have had a heavy winter, with a Wind River snowpack of 170%. Releases from Boysen into Wind River Canyon are now at 3000 CFS and should continue there for the foreseeable future. We will see what happens to our spring dry fly fishing on the Bighorn. Paula and I have just returned from another adventure in New Zealand. We first went there in 1976 and it is our fondest spot and brings back ton of memories. We really learned to sight-fish there and this morphed into sight fishing on lakes in the Winds and also to bonefishing. We can spend all day just looking for fish to make a mistake and show themselves. We have two trips specifically for golden trout this summer. One is backpacking and the other is horse supported. See under the dates section of the website. This time of year is so exciting! October 18, 2016 We have been quite busy this fall. September has been a rewarding month on both the Bighorn and our local streams. We have had enough rain to bring everything into good order. The hoppers are still out, but our focus has been more on the tiny dries (both Tricos and Baetis) and on streamers. Neither have been perfectly consistent, but a day fishing can't be taken away from you. On the Bighorn the flow has remained steady at about 810 CFS and the weed has cleared up. We have started to lose our Tricos but Pseudos are stronger each day (these, I think, are now classified as a type of Baetis). We usually can find pods of good fish along the scum lines. but it takes very accurate casting to get them. Don't flock shoot is the mantra. It is tremendously fun and it is only going to get better as the regular fall baetis come into play (they are bigger). We often fish with a bigger "sighter" fly with a black wing, then a more appropriate Baetis immitation. Most fishermen on the Bighorn are throwing nymphs or streamers, so we almost have this fantastic dry fly fishing to ourselves. The branches of the Popo Agie and the Sweetwater have the feel of fine fishing, with crystal clear water and willing trout. This is our favorite time! September 11, 2016 How do you know it's fall? You get a bit of time to go fishing yourself. Your wife wants you to take her fishing. The hens that you raised from chics start to lay eggs. The night and day are about equal in length. It's a wonderful time of year. For me far better than the spring. We have some very skinny water in our local streams, but our results have been good on a few of them, and out days have been wonderful. All waters fishable except for the N. Fk. Popo Agie. Streams and river around Dubois in good shape and fishing well. The Bighorn is running at 930 CFS and has been a bit slow. We have been catching fish on streamers and dries (expecting it to have more dry fishing). August 19, 2016 Well, this is the first rain in perhaps two months. We've all been flat out mostly in the mountains. Stream flows are way down (about as low as they get). We have managed to catch some fish on hoppers locally. The good news is that stream temperatures have dropped to around 60 degrees in the mornings. Hank was on the Bighorn on Wednesday and reported no tricos, no rising fish, but solid hopper fishing. They are releasing about 1250 CFS, and we are expecting better surface activity as the water cools. It has been hot in Thermopolis. We will be over there quite a bunch once we finish our last mountain outing this coming week. Looking forward to the fall. It feels like we have gone there already. June 30, 2016 We've had plenty more hot, dry weather and our streams are all coming into fishable shape. They should be at their best. The Wind River below Boysen is 3000 CFS, going to 2000 or 1500 soon. Reports of plenty of grass below the canyon making sub-surface fishing tough. The Wind River and it's tributaries in the Dubois area are all clear and everything near Lander is clear, but maybe the slightest bit high (Sweetwater and the branches of the Popo Agie). We start our mountain trips in early July and everything in the high country should be just right. Now is the time to really get after it. May 19, 2016 Now releasing 5400 CFS from Boysen. Fishable in canyon (barely). Hold onto your hats. Runoff really hasn't started yet. I predict more fishable water the end of June. Ventured to the Bighorn a couple of days back in search of trout and the wily asparagus (it comes out in this region in early May). 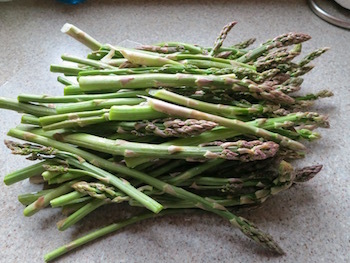 It is a big year for asparagus and not a bad day for fishing. It was bright and sunny and although we saw the blue wings, nothing was coming to the surface. The Bighorn is now running 3000 CFS and the trout are mostly pushed to the banks and slower spots. Nymph fishing was steady, but it felt like the dry fly fishing would have been good on an overcast day with little wind. Also appeared to have quite a number of hoppers out already. I expect the fishing to be real solid on the Bighorn, unless we get more rain to dirty the water or they increase the flow any more from Boysen (and this is GOING to happen, we just don't know when). As long as it remains cool, the real snowmelt will hold off, precluding dumping water from Boysen. If it gets hot, watch out. I'll just say that we've had a remarkable stretch of weather! Since late March, Lander has recieved about 13 inches of moisture (total annual precipitation is just under 13 inches). The Winds snowpack on the Eastern side sits at 135%. We had 6 1/2 inches in our raingage at home in less than 48 hours! Yes, the streams have come up. I expect most to be unfishable for a month if not longer. Bureau of Reclamation increased flows from Boysen to 2150 CFS in anticipation of the runoff from this crazy weather. Wind River Canyon is still fishable. The Bighorn at Thermop was quite off-color when we were there just before this last strentch of rain. I expect the water there to be murky for at least another week. On the flip sie the Western side of the Winds has not received these storms, and the snowpack there is 86%. It is a good bet you won't want to go into the high country from our side until early July. Might consider the west side. Perfect spring day on the Bighorn yesterday. Flow of 600 CFS which is a touch boney. The little mayflies were out and the fish were rising. What could be better? We fished dries all day. Some of fish were willing and some were not, but there were rising fish wherever we looked. As always, seeing your fly is key and the accuracy of the cast. Couldn't have been better. How do we know it is spring in Wyoming? Well, of course, we start seeing blue birds, but also the rhubarb starts sticking its head up. BUT, it wants to snow every couple of days. The mood swings of the weather has been particularly noticable here in late March. February and early March were downright balmy. 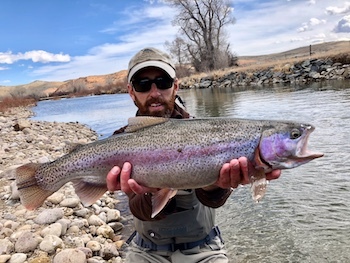 Hank was out on the Bighorn and locally quite a lot (with nice results on nymphs). Just when we're thinking dry flies, the high temps drop into the 30's and we get a foot of snow. In our business, however, we never complain about too much water. We always need it at some point in the arid West. The Bighorn has run at a steady 800 CFS all winter, but was recently dropped to around 600. The Bureau of Recreation has flushed the river for one day with 3500 CFS and now we're looking for our spring baetis emergence. Wind River Range snowpack has been below average all winter, but has now started to creep more towards normal. Let's hope this trend contiues. Forecast is for another interesting week of weather. Our bookings are solid for this summer in the high mountains. We have several trips that could use a few more people and plenty of completely open dates. Call for details. We look forward to the season. Fishing season is winding down and winter lurks just behind the mountains. We have already had "termination dust." That is the term Alaskans use for the first snowfall on the hills that is going to stay. Hank and I did a campout on the river a weekend ago and yesterday the girls (Paula and Louisa) did a boat ride with some catching on small dries in the afternoon. We have had far too much fun this fall and are sad to see it ending. I will be helping with the highschool nordic team again this season starting on the 16th. Paula is signed on as Acting State Director for TNC until a new director is found (probably by March). Then we may just head into the perpetual sunset catching the odd trout or bonefish, enjoying the fresh air, and doing exactly what we want to do (almost). The flow coming out of Boysen remains at about 820 CFS and should stay steady through the winter. 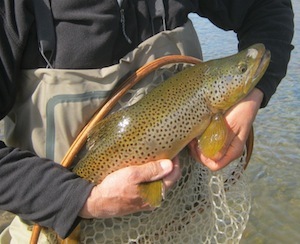 Fishing has been slow on streamers and fair on nymphs on the Bighorn at Thermop, but very satisfactory on small dries during the afternoon baetis hatch. It is demanding, but really fun to watch a dozen heads come up in staggered choreography. Does it get any better than this? It's been a long and glorious Indian summer. Everyone asks, when will it end? Colors in the Lander Valley are at their peak, but all it will take will be one good breeze and all the leaves will be gone. Fishing has been good on the Bighorn and in Wind River Canyon. Baetis are in full swing below the canyon, and it couldn't have been any better yesterday. Lots of heads, looking like those porpoises you see at Sea World, coming up in unison or on a perfect stagger. They weren't always easy, but you had plenty of chances. Flow from Boysen is steady at about 830 CFS. Hank reports good results in the Canyon itself. 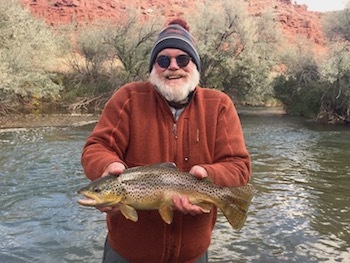 My friend Bruce Hampton and I took a "busman's holiday" yesterday and fished the Bighorn. Of course we picked it because it was supposed to be cloudy and we were looking for heads. River is still flowing at just over 1000 CFS and has been at this height quite a long time now. We put on at 7:30 am and found rising fish from the beginning. There has been a Trico dun hatch early for months now followed by the spinners. We fished a larger parachute adams (sometimes with a black post in the silver glare) followed by a trico spinner. We found willing fish (usually in pods) until about 2pm, then it shut off except for really small fish in the middle of the river who started to come to the tiny mayflies that appear in late afternoon. These are not the regular fall baetis (Blue wing olive) that appear about now, but a smaller subspecies. Large fish do not seem to feed on these much, even in a heavy hatch. We are still waiting for the regulr blue wing hatch which should be on now, starting around noon. The water temp was in the 60 to 62 range in mid-afternoon, and we expect that this is what may be holding them back. There is still quite a bit of floating grass which precluded any streamer fishing (although the dry fly action held our attention). I think you could have done fairly well fishing nymphs in faster riffle water. We saw lots of fish scurrying away from us in that stuff as we passed over. All in all, I'd rate it as a great day if you can "throw it." Often times these are fish of a hundred casts. Absolute accuracy is the key. Tight loops turning over in a verticle plane (slightly sidearm casting is not as accurate). As we say, it was the best day ever!!! Hank and I and Jim finished mountain trips in late August and have been busy locally, especially over on the Bighorn. The flow out of Boysen is at 1100 CFS. I would rate the fishing as only fair, although there is good trico activity on most mornings and hopper fishing in the afternoon. There is plenty of drifting "grass" which makes numph and streamer fishing problematic. A cloudy day is welcome and means that fish rise easily for longer periods of time. We enjoy spotting heads and trying to get as close as possible. You really need to be able to "throw it" right now in order to do substantial catching. I'm expecting the fishing to only improve. Local streams are dropping into the pretty skinny range and except for the Little Popo Agie we have not been fishing them. Things in the Dubois area look a little better, since there is some larger water. We are really looking forward to our fall fishing! Finally turned summer out here in Wyoming. We even have haze in the air tonight (I assume it is a fire from somewhere). Our local streams have just dropped pretty substantially. The high Winds are still very green with amazing flowers, BUT we could use some rain. Wind has been the word for the mountains this season (but it has kept the bugs off). Perfect conditions right now in our range. Wind River flow below Boysen is now at 1300 CFS and should remain that through September. Fishing has been reported slow over there. We won't be over until late in the month. Tricos have been out and some hopper fishing. We've all been flat out in the mountains and the weather has made things more interesting. It feels like we have had almost constant squalls. Actually we find that people feel like they have accomplished a lot when they have to put up with a bit of "interesting" weather. 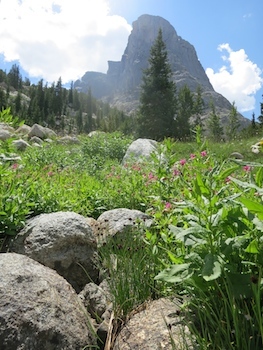 Nonetheless, the Wind River Mountains are spectacularly beautiful, green and flowering. The bugs are out, but due to the wind, they have mostly not been a factor. Although there is not a ton of snow left up high, everything feels wet, which should bode well for our small, lowland streams in August and September. The flow out of Boysen into Wind River Canyon has dropped now to 1350 CFS, and the river is reported to be very green. We won't be over to fish until late August. Jim has done a ton of short backpacks mostly concentrating for goldens. Hank and I are just back from a trip with a photographer, keying on goldens. You should see some fine shots when we get them (he did plenty of underwater, too). Great summer! Everything in our area is now fishable and the Winds are totally accessible. Wind River flow below Boysen Reservoir is 3500 CFS and will drop some more in July. 4th July is a huge holiday in the Lander area. All the older kids come home, more so even than Christmas. So the festivities are revving up. As soon as it's all over we'll be headed into the mountains for our first trip. It has been real summer now for over two week with temperatures mostly in the 80's. Rivers are all now dropping and have been doing so for exactly one week. However, the Wind River below Boysen is still at 7400 CFS, but I do expect it to start dropping soon. Rumor has it that the water is reasonably clear to Thermop and that fishing on nymphs can be really excellent on the slow seams. As the water drops, I am expecting dry fly activity to skyrocket. What a flush of green we have all over Wyoming. It is perhaps as pretty as it has ever been. Flowers are abundant and hummingbirds are homing in. We will be hot and heavy in the mountains right after 4th of July. Looks to be a great year. Very high water everywhere around here. Releasing 7400 CFS out of Boysen. It will all be over in a couple more weeks, then fishing will be at its best! Snow pack dropped remarkably. Should be an early year over the highest passes into the Winds. Time to stock up on your fly tying and gardening before the heavy fishing comes! Wow! Have we had a lot of rain for Wyoming. I've measured almost 8 inches in our rain gage in May near Sinks Canyon. Wind River Canyon has been closed to train and vehicle traffic due to mud and debri slides. They started dumping water about May 21 from Boysen when they increased flows to 2000 CFS, and today they are releasing 3700 CFS. Hank and I fished on Saturday with only so-so results, but now we can't count on fishing the Bighorn for awhile, until things settle down. There have been numerous flash flood watches, but it appears things are settling down. Snow pack, if you can believe it, on our side of the Winds is now being reported at 118% of normal. What a beautiful spring! I used to call these million dollar storms when we had the farm in Crowheart. Let's call this one a billion dollar storm! I know the country can always use moisture and our trout are always better off with more rather than less. Needless to say, not much is fishable at this point. Stay tuned! Wow, what a wonderful spring we are having in Wyoming! We have just had a magnificent storm which has dropped 3.5 inches of moisture at our house on the slope of the Winds. April also had solid precipitation, and even though our snowpack now registers at 62%, we are feeling blessed with all this moisture. Runoff in our area started about 10 days ago, but has not made the local streams completely unfishable. With some warm days, flows could increase considerably. I am still looking for runoff to pretty much be done by mid-June. Hank and I have been to the Bighorn a bunch and try to fish dries as much as possible (this means the little blue wings). Nymphing has been solid, as well as a pretty fair streamer "bite." We're expecting more of the same through May. Things will change heading into June with yellow sallies appearing and maybe some cicadas (we will start fishing some bigger foam flies), and maybe even Tricos. We have seen increased traffic on the Bighorn, but it hasn't affected the fishing. Lots of clean, hot rainbows. We still have some days open for fishing there in May and June. We're not expecting the releases from Boysen to get very big this season (probably no more than 2000 CFS, if that). Normal summer flow is 1300 to 1500 CFS. I was recently honored with the Orvis Lifetime Achievement Award (guiding). You can view the interview with me that appeared on local TV. Read the blog post from TU. Yes, it is spring in Wyoming! Vegetation is greening in the Lander valley and we notice that the goldfinches are changing to their breeding plumage. Paula and I have just returnd from 6 weeks in New Zealand, doing some of what we did last year plus some new adventures! Again, we are so lucky. We had enough good fishing to be sated and some difficult fishing to be duly humbled. Paula wanted to tramp (hike) from beautiful beach to beautiful beach (we did that and there was no fishing). It is a diffucult country not to love. The people are always kind and helpful. There is lots of great country (meaning topography) and plenty of it is truely wild). I'll bet we go back some more before that long airplane flight takes its toll. Here is Wyoming we have had a relatively mild winter with a below average snowpack. It looks like we are a solid month ahead of last year at this time. Many should be able to get into the high mountains in June without too much snow. 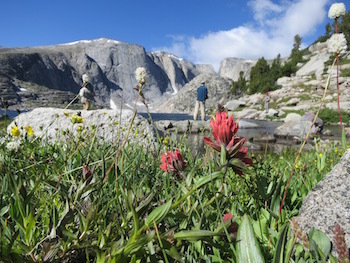 These years one notices fewer flowers and fewer mosquitos, but not much difference in our Wind River Mountains. In the lowlands, our small streams can be too shrunken or too warm to fish for a period in late August. We do hope we get some late spring and summer moisture. While Paula and I have been galavanting in New Zealand, Hank has been holding down the fort and sampling our local fishing. He has fished all winter long, and the results have been largely good. Last report from the Bighorn at Thermopolis has been good with some surface (baetis) activity starting. We are fully ready to be over there as much as we are called. Looking forward to a great spring, summer, and fall fishing season. It seems that when I look back on the year I always feel that it was wonderful. Is this pure hype or propaganda, or do we really enjoy our life, passions, family and business? I think (as I have often said), when you combine wonderful guests, a stunning environment, and an abosorbing sport, that's a pretty good concoction to produce that feeling of well-being. So, thanks so much for allowing us to have such rewarding work. If we didn't have our fishing guests, our world would feel lots smaller. Hank and I spent much of the summer in the Winds, and it was as pretty a year as we can remember. We had adequate winter/spring moisture, along with a rainier summer. This produced green, flowers, mosquitos, and snow banks. And the trout never complain with more water. 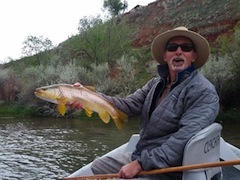 Besides our mountain trips we had a good scattering of days on the local streams, including drift boat fishing on the Bighorn near Thermopolis. Jim Ferguson was also out on trips for us this summer, with niece Anna Ferguson as chief of good humor. Paula has been struggling with extricating herself from workaholism (meaning she is in the slow process of retiring from The Nature Conservancy). She loves being out and with that in mind we are soon headed to do some bonefishing in the Bahamas. We will again be spending the late winter in New Zealand. Louisa Hunker and her husband Nick Storm have purchase a house in Lander and have been heavily into changes there all summer. These changes are almost complete. Paula and I both have enjoyed raking leaves and painting at their place. Molly Hunker has ended up at the Syracuse University on a semi tenure-track in the Architecture department. Although very busy early in the semester, it seems that all is going well as she has settled in. Hank has mostly been guiding fly fishermen both for Sweetwater, but also for Wind River Canyon Whitewater. This fall he has finally brought in the bacon (an elk is now hanging in our garage). What a wonderful early fall we have had so far. Feels like it has just been a blizzard of fishing. Lots of visitors and local fishing, plus Paula and I did a 6 day jaunt in the backcountry. We headed in in a snowstorm (the forecast was for clearing and sunny after that, which is how it turned out). I connected some dots on the map of the Winds. Never did this trip before. It felt wild with almost no trails, and we spent most of our time above timberline. I told Paula that I don't believe that I've ever been on so many boulders. We loved our route and the wildness factor. Just think, it is right out our back door! Not bad for a couple in their 60's! As for the local fishing, I've been out quite a lot and everything is holding up well, especially with the nice rain we are getting right now. The Bighorn has had a solid flow of water all summer. Late August and almost all of September has had a flow of 1500 CFS. They just dropped recently to 1200. Will be over there a bunch more before we'll call it quits. Plenty of rising fish to entertain us, especially on cloudier days. Also looking forward to throwing some streamers. The fish a all "worthy adversaries," as I call them. The canyon itself has been beautiful (haven't fished much there myself), but have seen some very large fish right on the bank, believing that they are invisible. A favorite time of year for us. And check out the latest adventure on one of our trips, cliff jumping, from the Broboys. What a beautiful month August has been! Rain in the mountains (but not too much), cool temperatures, and impressive high country wildflowers and mushrooms. It has been a joy to be out and alive! It is also wonderful in the lowlands with some rain and our small streams are still holding up. Hoppers are out and fishing has been fun. Looks like we'll have a great fall season. We have a couple more scheduled trips in the high country. Hank reports tricos in the morning on the Bighorn at Thermop and solid hopper fishing until it gets hot in the afternoon. Flow below Boysen has been steady at 1600 CFS and I don't see that changing much since the Wind higher up is still significant. We are expecting to do a lot of drift boat fishing this fall and are already looking forward to the Baetis coming on. Returned from the high country to find it in the 90's in the lowlands. There are still very large drifts of snow slightly below timberline to the highest peaks. It bodes well for our small streams come late August. 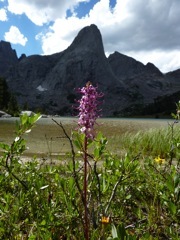 Flowers are at their peak in the high country and goldens and cutthroats are still spawning. The Wind River below Boysen Reservoir has been dropped down to 2150 CFS as of today, and it looks like they will continue to reduce flows down to 1300 CFS within the next week or two. That should be the level through the fall. Let's enjoy real summer! Busy mountain time is upon us. Hank and I just got back from pestering goldens on the 11th July. By tomorrow morning, Hank and I and Jim will be on different trips in different parts of the mountains. Our runoff is slow to subside. This is apparent when you see the flow through Wind River Canyon at 3500 CFS. Who knows when this will drop? I suspect water will be pretty high there for some time longer, since Boysen Reservoir is 99% full. All the streams in the Lander area are very fishable. I'm seeing some hoppers and there are good hatches of mayflies, caddis, and stoneflies. What this means is that dry fly fishing is good and anything fished well will work. The Winds are beautiful, but the mosquitos are fierce. We had another cancellation on the trip August 9-15. We would like to find a few more people to join us at the last moment. It is summer. Some afternoon showers are expected. We had some days in the 90's in the lowlands. Now settling in to around 80. Very nice. Hope all are having great fun. Our run off has peaked although most rivers are still too high to be comfortable. The Wind River below Boysen is now at a little over 2000 CFS and is fishing well. The reservoir is 93% full, and whether they will need to "dump" water remains to be seen. I expect that releases will be at least 2000 CFS through July (that is usually good, except for wading fishermen). It is still as beautiful as it gets in almost all of Wyoming. Don't plan on getting to the high mountains until July. Cool temperatures have remained the norm and they are predicting 6-12" of snow tonight in the high country. This is all good for fish. The mountains will be beautiful and the mosquitos will be a force to be reconned with. It has warmed up and our run-off is in full tilt mode. There is some flooding in the state. Unless it is dammed, it will be too high to fish comfortably. The Middle Fork of the Popo Agie went over the overflow yesterday where is goes into the Sinks in Sinks Canyon. The Wind River below Boysen is at 2750 CFS and very fishable. We had good results on the Bighorn on the Memorial Day weekend. The rumor is that the BuRec will increase flows from Boysen to 4100 in June. Wyoming is at the peak of it's beauty right now. Everything is green (except around Shoshoni), and the wild flowers are extremely profuse in the foothills. It doesn't get any better than this (except that our fishing possibilities are limited). The deer and antelope right on our property look like they could drop their babies at any moment. Hank and I are available to take you on a float trip on the Bighorn. Three or four days in the 60's, then wammo! it snows 12 inches. Isn't that just Wyoming? Yes, today is bright sun after that storm yesterday. The red-wing blackbirds are back as well as the bluebirds. Paula and I have just returned also after spending a memorable month of March in New Zealand. We first went to New Zealand in 1976 and the feeling of that place, its people, and its fishing have been with us ever since. We were emualting some of the same things we did way back when. I even wrote an article in Fly Fisherman Magazine entitled "Tramping for Trout in New Zealand." Lots of tramping (backpacking) and fishing back-country waters. Some of these places Paula and I hadn't visited in close to 40 years. 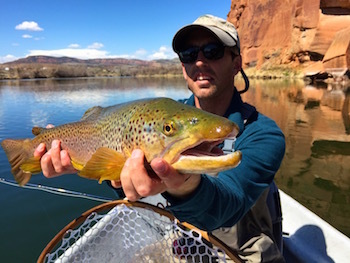 You still can't believe the size of the fish, the clarity and color of the water, and how thrilling it is to see one of these large trout take your fly. Paula caught a nice fish on both the first day and the last day of the trip, and we fished most days in between. Catching is never easy in New Zealand. I say that I just live for the "encounters." On this particular trip we started in Te Anau and gradually worked our way North, finishing up near Nelson, all on the South Island. I hadn't fished there in March in a long while and found the fish pretty picky and spooky. I think this was due to generally low water. We did notice that the rainbows were easier to catch than the browns. We could not get a spotted brown to eat a dry fly. Nonetheless, we really had fun. We relearned that those fish don't tolerate a messed cast or too many in the wrong spot. We learned that the weather forecasts are good there now and you can make a dash into the bush when you see a weather window. New Zealand is not really green for the lack of moisture. We learned what was absolutely necessary to carry in your pack. We had fun with our equipment and keeping the pack weights down. We learned that you can land 5 pound plus fish on 5X.I think a New Zealand trout must average around 4 pounds. It is rare to encounter a fish less than 20 inches. I measured many fish at 3 hands plus (my hands are about 8 inches). We encountered a farmer on our last day who asked how the fishing was. Our friend Peter replied that it was pretty tough. The farmer smiled, "Can fishing really be all that tough?" A day after being home Paula was ready to hop on that 12 hour flight again. We are lucky. Looks like we have a good snowpack in our Wind River Mountains. The West side of the divide is at 160%, and our side at 122% (with the Lander area on the low side). They are predicting a big run-off for most of the state. Boysen flows are at 1500 CFS right now and are forecast to be 2600 in May, 4100 in June, 3700 in July, and 1300 in August. Water is always better than no water. We will see what this brings to float fishing in the Thermopolis area on the Bighorn. Hank reports it has mostly been very good this early spring. He says the Baetis are starting to come off. I've heard of some good days on streamers, but I bet most are still fishing nymphs. 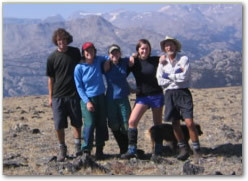 We have quite a few bookings for summer mountain trip, a few spring days on the Bighorn. 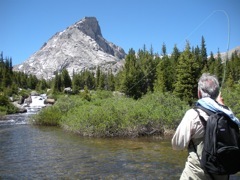 Just talked with someone who wants to do a backpack into one of our favorite golden trout places in early July. We could use some more guests for that one. I know that most have had a pretty trying winter, but I hope the sun warms your bones, and that you wake up smiling. We've had nights already below 0 and some have gotten out to cut their Christmas trees. This year has brought a bit of flux to both our fishing business and our family. All of which has been good if not great. Molly Hunker took a fellowship at University of Illinois, Chicago Architecture School. So she has moved to Chicago and has really been enjoying her year and the change from LA. Louisa Hunker and her husband Nick Storm have moved back to Lander. They are both excited for their lifestyle change and are anticipating some of their favorite activities, cross country skiing and rock climbing. Nick is employed by the NOLS Professional Training program and Louisa, after becoming a master of communication, is still looking for meaningful full-time work. Hank had to shoulder much of our guiding this summer, especially since Paula and I took two two-week trips (one riding bicycles in France and the other hiking in the Dolomites of Italy). Our summer fishing season was steady, fun, and rewarding for anglers. We did a lot of lowland fishing concentrating a bunch on our Bighorn floats. It was a pretty typical year with the early season being phenominal and then August getting hot and the small streams shrinking to unfishable in some cases. The Bighorn held up until temperatures hit the 70 degree mark. You could sure tell it, because at 3pm the fish shut down. It is always fun to fish foam flies in real skinny water. Mountain trips were excellent, although our client base was down. After mostly no rain all summer, September let its hair down. Hank got deluged on one trip and then it was 4 snowstorms. We're hoping that all this fall moisture builds up the ground moisture so that our small streams don't shrink so much in late August. At least we got a great start on it. Spring and fall fishing on the Bighorn has continued to be phenominal. Nymphs always work, but many of us like to concentrate on the heads for dry fly fishing. It is something to experience. Paula was just amazed how good it could be! Our fall has been punctuated with snowstorms. More snow on the ground today. None of us can remember such a wet fall. We are hoping the ground everywhere is so soaked that we never have to worry about shrunken streams again. Most of our streams and rivers have had flows close to all time highs for this time of year. Just fished four days last week over on the Bighorn. The blue winged olive hatch (sometimes called BWO's or baetis) has been strong even on sunny days and the fishing has been solid on these tiny dries. Paula said, after fishing with me yesterday, "I don't think I've ever had a better day fishing." The fish were just wolfing these diminuative mayflies for hours and hours, it seemed. Our arms got tired. 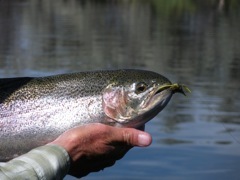 We caught largely big rainbows which are very healthy and strong. And it was a perfect Indian summer day in the 60's. You should experience it. You can really feel it is fall now here! We had a big rain the middle of the month, when Colorado got all the flooding. Hank was in the mountains looking for golden trout, and it was trying weather to say the least. We got so much rain that the local streams have come back into fishable condition (mainly the branches of the Popo Agie). Wind River Canyon is flowing at a little over 600 CFS, the water has cooled, and we are seeing Tricos still, but no Baetis yet. We are expecting a big snow (even in the lowlands) in the next few days. That's Wyoming for you: summer one day, winter the next. Always nice though to get into fall, slow down, and enjoy some of this fishing for ourselves. Our oldest child, Louisa, was born 33 years ago today. I'll have to tell you the story! Still summer in Wyoming, but signs of fall are in the high country with the tundra turning colors. Lowland streams in the Lander area are all too thin to fish. Fishable waters include: Wind River in the Dubois area, East Fork Wind River, Bull Lake Creek, Wind River Canyon, and the Bighorn. Hank will be in the mountains next week for the last extended trip of the year. We do, however, have a fair amount of fishing to do before the fall turns to winter, especially on the Bighorn. It's getting to be our favorite time of year and we're looking forward to yanks on the streamer and dorsal fins after the tiny Baetis dun dissapears. It's been hot in Wyoming and some of our streams in the low country have shrunken to trickles. 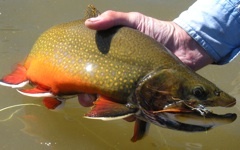 The following have enough water to fish: Little Popo Agie, Middle Popo Agie in Sinks Canyon, Wind River in the Dubois area, Bull Lake Creek, Wind River Canyon, and the Bighorn. Hank and I have been going in opposite directions. I was in the mountains where it is cool enough to frost and the flowers are still out. Hank has been fishing in the heat, mostly on the Bighorn and in the Canyon. He reports really excellent fishing, especially before 3pm. (some streamers, some nymphs, some dries). It will continue to cool off as August wanes, and we expect solid fishing through the fall. Wonderful 4th of July in the Lander area, and even a few drops of rain and definitely some clouds. Rivers are in very nice shape (except for the Upper Wind, which was running very red due to thunderstorms). Local fishing has been good and hoppers are getting larger every day. Hank went into the mountains today, searching for our favoirte golden trout. Lets hope we continue with a little bit of moisture for the rest of the summer season! They are bailing hay throughout Fremont County; lowland wildflowers have largely faded; it is still very green, and the temperature is hovering at 90. Hank and I have been out guiding a bunch. Fishing in the small streams around Lander has been stunning. Most everything is at a very fishable level. Middle Fork of the Popo Agie is still a bit high through Sinks Canyon. Sweetwater is already too low below the Canyon. Canyon is OK, but I wouldn't fish there much longer, unless we get rain. The Bighorn has been quite productive on dry flies, especially early in the day. I have reports that the Wind River High Country still has some snow, but that lakes to the 10,800 foot level are iced out. Busy, but life is good. Summer rain? It would be nice, especially for the small streams for August. Starting to turn summer in Wyoming. We've had a cool, dry period, but it looks like heat is just around the corner. Big run-off has not happened, but I predict higher water with the higher temperatures in the next week. Then streams should drop again by 20th June. We've even seen a few cicadas around. Could it be good? I expect much of the high country to be accessible in late June. We've been down to the Bighorn quite a bunch. Still seeing good hatches of baetis on cloudy days, and the streamer fishing has knocked your socks off. It has been running pretty steady at about 1200 CFS, and I don't feel it will vary much for the rest of the summer. It also has been running some moving weed. I don't know if that will improve. Water temperature on Wednesday, June 5 was 55F. 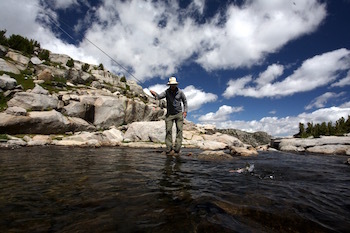 Hank is guiding a bit in June down in the canyon for Wind River Canyon Whitewater Fly Fishing, on his free days. It is as pretty as it gets and we hope to see you soon. It's about as green as it ever gets here in the Lander area! Certainly a far cry from last season. We can still see the high peaks completely covered in snow, as we back away from the mountains to gain perspective. We keep seeing more interesting birds like Lazuli Buntings, Bullock's Orioles, and black-faced Ibis. And yes, a multitude of flowers. When we get these wet late springs everything happens at once. Our local streams are not too too high to fish and the Bighorn is pretty steady at 1250 CFS. Fishing there has been awesome. Sometimes on dries, always on nymphs......and the streamer fishing has been real steady to almost real exciting. We're quite busy the end of June and early July. What a great time of year! It is certainly spring in Wyoming now! Warming temperatures have just brought our streams up in the Lander area. We were fishing them on Saturday, but they will now be largely unfishable until runoff starts to subside. Our leaves are bursting from the aspens and all trees should be leafed out by May 22 (that is the date I always say). Wild flowers have started to pop, the yellow rumped warbler is nesting, and stoneflies have started to emerge. Irrigation water is now coming from Boysen and Wind River Canyon and the Bighorn are highly fishable with a flow around 1100 CFS. I don't forsee a huge increase there since the reservoir should be able to absorb the spring influx. The upper Wind around Dubois will be high and dirty for a considerable time. I would predict the high Winds lakes to ice-out later than last year, somewhere between mid June and early July depending on the elevation. Our snowpack has dropped to 71%, but this time last year we were in the 30's. Looks like a great time to be out! So, another nice snowstorm and our Wind River snowpack is up to 96%. Hooray! This year all the storms have been on a Monday. Some years they have come on the weekend and everyone complains. Everyone I talk to has been catching fish. I'm hoping to catch a few this week on my favorite, tiny baetis imitations. Just returned from our annual Orvis get together. Saw lots of old friends and cast the latest H2 rods. Rods are impressive and always great to see old friends and to be reminded that we are truly fortunate to do what we do and have such great fishing. Two big snows in the last week (one while Paula and I were bonefishing in the Bahamas).....we hit the second. Those bring our Winds snowpack up to 88%. We hope we get more. Fishing has been great on the Bighorn and a few spots locally (although it feels more like winter than spring). Hank reports the baetis dry fishing on the Bighorn yesterday as "as good as it gets." He also added the classic, "you shoulda been there." It is spring in Wyoming. We can smell it. However, we always have our regressions. The leaves aren't fully out until May 22 (that's what I say). But we have red-winged blackbirds, meadowlarks, and bluebirds. There's a touch of green to the grass and the aspens are getting their catkins. Our high mountains only have an 80% snowpack at present, so we are hoping for our big spring storms. Still, does it get any better? An today, Paula and I are headed off to the Bahamas for a bit of bonefishing. Hank had a getaway there in February, so we're keeping our tools sharp. I love the anticipation, tying flies for the occasion, and all that. We are getting calls and emails about the summer and fall, but still have quite a few opeings and trips that need more folks. Our local fishing is good right now and we'd love to take more people on floats of the Bighorn. It's comin' on Christmas and we've cut the tree and decorated it here in Wyoming. The snow has started to stack up in the Wind River Mountains, but not here in the low country. As in many places we had a way warmer and drier year than anyone would want. It made for nice weather on our trips in the mountains and a very long fishing season this fall (I think we fished into December). A fire ban was in place all summer, so our guests unfortunately could not enjoy their evening camp fire. Otherwise, all was about normal in the high country. Fishing was just as reliable as usual, although our spring spawning trout (rainbow, goldens, cutthroats and hybrids) were earlier than normal (mostly in late June). Last season they were spawning into August. Always good to see the annual cycle. Hank and I had a particularly nice season in the Winds, not as many trips as we sometimes have, but plenty to get our "mountain fix." We did, however, pick up quite a lot of day guiding (some really on the spur of the moment), especially on the Bighorn with our driftboat. We've both gotten to know the river down near Thermopolis and feel we can give a quality experience. Hank fished a lot with cicadas and big dries this early summer and fished lots of small dries (blue winged olives) this fall. The amazing thing there is the size of the fish (always one over 20 inches), and if one technique doesn't work another will. Hank fishes a lot of streamers, others fish with the typical nymph rig. Even your classic wet fly swing can pay off. We're hoping we will get more fisherfolk for the spring and again next fall. Our low country streams around Lander were practically unfishable in August and early September due to low and very warm water, but we had hoppers that were "biblical" in late June and July. It was really fun, especially with the tenkara outfit. I was out one day with Paula and told her it was so easy it must be illegal. The real value is in the perfect drift, because no line is on the water. Really does turn you into a Great Blue Heron. I showed a number of folks (including a 10 year old girl) how to use it, and they caught on right away with no difficulties. Fishing is still hot over on the Bighorn. Hank and I go every chance we get. He fishes streamers. I look for heads and fish small mayfly dries and soft hackles. It has really been fun and the fine fishing just seems to go on for ever. Hank has just posted his latest video. Has shots from a little of everywhere and is really fun. Click here to view it. Awe, fall in Wyoming! It is my favorite time. I've been fishing 7 days in the last week (maybe 8). Love to chase the big ones taking the little dries. The whole Wind River Valley is at it's most beautiful. You don't even have to catch a fish to be happy. Hank has been out a bunch on the Bighorn. The Tricos are still out in the mornings, and some Baetis are coming out. We really need some cloudy weather to get those Baetis hatching. Streamer fishing has been solid over there (water flow about 650 CFS and slowly dropping to who knows, 500 maybe lower). Streamer fishing should get even better as Browns get real aggressive. The other morning I saw a rainbow in such shallow water that its back was out of the water. They love to get in that skinny stuff when they feed on the small mayflies......and these are 20"+ fish. Almost everything else is too thin to fish except for the upper Wind in the Dubois area. Hank has an elk hanging in the garage already and an antelope in the freezer. We just hope that this Indian summer lasts until the spring. Summer is winding down and it's been brilliant if you like warm, dry and blue skies. I would have liked more rain. It has been very dry with a fire ban in effect all summer. We have had no campfires or toasted marshmallows. Nonetheless, it has been wonderful to be in the high country of the Winds. Fishing has remained excellent, and although streams have shrunken, water temperatures have remained cool. One of the big plusses has been that we have had very few bugs! Lowland streams were extremely giving in late June and early July. Hoppers were out and the browns were really eager. Paula and I fished one day with tenkara rods. After doing so well we couldn't believe it, I said, "This is almost criminal." Well, we'll take that every so often. Streams are real low right now, but most are still fishable. Some should be left alone in the afternooon. I was just down on the Bighorn for the first time since early summer. The tricos were out early and the big fish rising. Later in the day we did well for big fish on foam terrestrials (using 2X and 3X tippets). Even caught some rainbows on streamers, but didn't try nymphs. As the weather cools, we will start to see fall Baetis, especially on cloudy days (will we get any?). We should have months of fishing left on the Bighorn. Plenty of free days on the calendar this fall for Hank and I. Come visit! 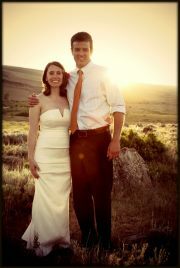 Well, we "made it through" our oldest child's wedding. Man, was it spectacular, touching, and fun! Nick Storm and Louisa Hunker are a pair we should all be so proud of. They are everything a father (or mother) could ever dream of. The weather here was perfect, and I danced all night. What more can one say? It has not rained a drop here since my previous post in May and it has also gotten real hot (like many other place in our nation). That means we could have really shrunken streams by late summer. The upside is that the fishing right now is tremendous and the number of hoppers out is stunning.......at least the fish will have plenty to eat even though they might not have much water. The Shoshone National Forest has just announced a total fire ban for the backcountry......looks like we won't have any campfires unless we get a bunch of rain. Cicadas have been strong in Wind River Canyon, and Tricos and Yellow Sally's have been heavy on the Bighorn. Locally, we have seen quite a few Green Drakes and PMD's and there have been Brown Drakes on mud bottoms in certain areas. What a lot to do and so little time! Hank and I have been out quite a bunch and have mainly been fishing hoppers with fine results. Looking forward to the high mountain season in the Winds! Summer has arrived in Wyoming. We have had two nice rain/snow events in the Lander area in the past two weeks. An inch of precipitation in each. That has helped our dwindling snow pack, but we will need more if we want much water in our lowland streams come August. It appears that our season is about a month early. I have heard reports that lakes in the high Winds at 10,000 feet are opening. You could make a nice trip into the mountains (except for the highest lakes) right now. 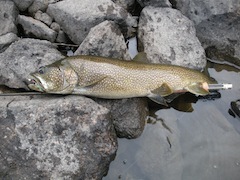 Hank is reporting that the fishing is good on our local streams (which are about finished with run-off), even on dries. He just caught a bunch of nice browns on his Tenkara using a parachute Adams, just last night. I am seeing lots of small hoppers. I think it is going to be another bonanza year for hopper fishermen. Their are also quite a number of cicadas (locusts) about......that means the biggest fish are stationed in shallow water looking for a big and easy meal. Rivers with dams will have plenty of water all summer since they held a bunch over for irrigation after last season's huge snowpack. Wind River Canyon below Boysen has been flowing at about 1000-1100 cubic feet a second, and I cannot see it rising to more than 1500 all summer. Dry fly fishing is on using bigger foam flies. Nymph and streamer fishing should be solid. The Reservation backcountry opens on June 1. We've got plenty of room to get pleasantly lost. The best fishing of the year is just starting......hope you can come join us. We have openings for you right now! Spring is at it's height in Wyoming. The weather has been moderately warm and river and streams have risen, but are mostly all fishable. 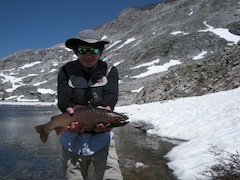 Hank has been down to the Bighorn quite a lot and reports excellent fishing on almost everything. There has been some good dry baetis fishing along with caddis in the evening. Nymphs seem to always work well, anything from San Juan Worms to craneflies to small mayfly nymphs. It is pretty amazing that so many different patterns could work. We are available to float the river with you all of May and June. We have seen many of our favorite flowers on the slopes of the Winds and the aspens have most of their leaves. I'll be looking for wild asparagus soon. I suspect all our trees will be fully leafed out within the next two weeks. Everything is early. Our snowpack in the mountains has shrunk. We hope the weather will remain cool and we get some spring and summer moisture. Nonetheless, fishing should be as good as always, which is really superior. We have plenty of open spots this summer if you are considering a mountain excursion or some day fishing in the Wind River Valley. Another spring, a whole different year! Last year we were looking at a record snow pack and this one, like many places in the country, is shaping up below average. Snow surverys show 68% on the East side of the Wind River Range and 72% on the West side. It was very pleasant in Lander all winter with just enough snow to ski on and keep us honest. We have had moisture in the lower elevations, so flowers are coming out and all will be green for awhile. 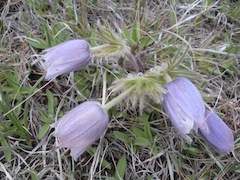 My favorite, the Pasque Flower, is out (see photo below).But the amount of snow in the high country could lead to shrunken streams come August. Our dam-controlled rivers will be fine, since the reservoirs were kept fairly high with last years runoff. Lets hope we get more spring moisture and a cool summer with some rain! Paula and I along with Hank and Molly Hunker took a late winter sabatical in the Bahamas. Good to get some warmth and to tune up our eyes on the sometimes invisible bonefish. We had some luck, but more importantly, thrived on the various blues of the Carribean, enjoying the slower pace and being truly disconnected from the world for just a bit. Highly recommended! Life is simple. Paddle the kayak. Get out on the shallow flats and look for bonefish. Hank has fished just about every week this winter and with some good results. He reports good dry fly action right now down on the Wy-horn (Wyoming's Bighorn), with fish rising to the spring Baetis and to midges. Come join us! We will be guiding there this spring, in the summer when we're not in the mountains, and in the fall. I love to fish the tiny mayflies, but the river is good with hoppers later and always with nymphs. It is also quite consistent if you like to fish streamers. The size of the fish is pretty phenominal. Never a day when you don't land a brown or rainbow or even a cutthroat over 20". Jim Ferguson will be back in a few days after spending all winter in Chile, doing some work on his place there. It appears to have been a bit frustrating, as there was a general strike, which pretty much shut everything down (you couldn't even buy gas). He gets two springs, two summers, and two falls every year. No winter! Big news for the Hunker family: oldest daughter Louisa is going to marry Nick Storm (a fellow NOLS instructor) this June 16 at our house on the slopes of the Wind River Mountains. We are really thrilled and excited. I always like to look back at our year, especially when the snow lays on the ground, the wind sweeps down the eastern flank of the Winds, and even though it hasn't been that long since we fished, it seems like that time has passed. I think back on catching big fish on tiny dries on the Bighorn late this fall, of the great hopper fishing we had late August and early September, of fishing lakes right at ice-out in late July, of mountain cutts still spawning in August, of all the snowstorms we had in May and June (we had six inches of snow on the ground at the house on Memorial Day Weekend). I think of all the wonderful people, those that truly love the outdoors and good country, during this fishing season. It was a wonderful and interesting year. Jim Ferguson is in Chile as usual, this year starting to build a barn/living quarters on his property on Lago General Carrera (near the outlet of the Rio Baker). Jim calls this place Aguas Azules. Hank Hunker has been doing lots of fishing on his own this fall along with spending plenty of time elk hunting (we do have an elk in the freezer that he shot). I've been building a chicken house (ask me about the saga), fishing when the weather has been nice, and now cross country ski coaching. Paula has been working on saving the good places of Wyoming, especially close to home on the flanks of the Winds. Louisa has returned to school, working on a PhD in Journalism/Communications at the University of Washington in Seattle. Molly Hunker is gainfully employed in LA, teaching architecture and doing design.Check out her stuff at mollyhunker.com. The big new things this year include the purchase of a drift boat that we will use for guiding on the Bighorn River near Thermopolis, particularly in the spring and the fall. There are particularly large fish down there and Hank has it figured out. I like to concentrate on the big ones rising to the tiny Baetis mayflies. I introduce myself to Tenkara fishing this fall and just had a ball. This is a Japanese system that uses a long rod that telescopes (like 12 feet) with a fixed line and leader of about forteen feet and no reel. It is particularly deadly in fishing George's patented technique of holding everything off the water except the fly. We have landed fish in the twenty inch range, but it has largely been heralded as a small streamk, small fish method. It has brought me and others I have introduced to it worlds of pleasure! Hank has come out with a new video that you should check out. Really some spectacular footage! Ruby has retired from her position of chief of kindness. She is getting a bit old and her diabetes makes it impossible to be her old self in the mountains. She is, however, her old self at home. Paula and I have just returned from the high country after a late season foray. What beautiful fall colors and perfect weather! Paula just loves being in the mountains even if it turned her feet to hamburger. Ruby joined us although she has diabetes and doesn't do as well as she used to. She got cataracts this spring and went blind, but she had surgery and you wouldn't even know. What a miracle! Long days on the trail are no more, however. We have just returned from our last trip in the mountains, complete with fallish weather. I think we have seen the "termination dust," which is Alaskan for summer is over and winter is coming. We had a wonderful time with our longest standing guests. Always a pleasure to see how much others can enjoy our wild country even in adverse conditions. It does remind me that our Wind River Mountains are particularly beautiful with the changing light of storms and clouds. Hank and I were both sent Tenkara rods by Scotty and Carolyn Heppel. If you haven't seen these, they can be amazing for small streams. This is a Japanese system with a long rod (like 11 or 12 feet), a braided line (like a furled leader) which is attached to the end of the rod, and tippet. There is no reel, so the system is like a cane pole and a string. For me it has been amazing fishing hoppers! You can reach across a current and fish the bank and get a perfect drift, because there is no line on the water....I've probably landed a 100 fish on it already, some as large as 20 inches. I have broken off two very large fish (if they go out in the current and the rod goes down you're out of luck). I have given it to friends to try and they have also been pleased. My friend Bruce ordered one that night. Check them out on the internet. Blue Ribbon Flies in West Yellowstone has been a proponent for years along with Yvon Chouinard. We're hoping for a long fall. Fished the Bighorn below Wind River Canyon on Saturday and caught fish rising in the morning using small dries and soft hackles. They were taking tricos in the rain. Very hard to see the rise, but it was almost a "no brainer" with the soft hackles. The rest of the day we floated down and caught nice fish on nymphs and streamers. Fish really didn't want to hit hoppers. Maybe the hopper fishing is over there. Our drift boat is ready to roll, and we have a long season. Join us on Wyoming's Bighorn. Hopper fishing in the Lander area is just amazing right now! The browns have lost all their abandon and just rocket off the bottom to attack your imitation. Sometimes they even hit it several times if they don't get it the first time. Do you think they want to drown the fly first? The ones that come from under the bank can take the fly like a freight train going down stream. If you haven't experienced this, come see us to try something that is utterly stunning and just makes you laugh! We have time in September and October, and Hank will be guiding the Bighorn. We have been fishing in the mountains since the 9th of July. Everything has been amazing and a bit of an adventure. Our snow pack has melted slowly and streams have been high, and some lakes have been frozen or partially so. Imagine getting to a timberline lake and casting over an ice flow and catching a golden and then having to drag it over the ice to land it! We have encountered lakes where the goldens and cutthroats had not thought of spawning yet. 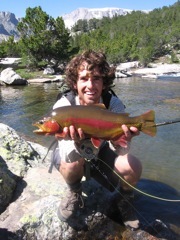 There were even cutts still spawning at the 10,000 foot level in late July. In some locations, I'll bet we see spawning fish in late August, and these are "spring" spawners. Nonetheless, fishing has been excellent and we've all enjoyed ourselves. There are lots of flowers out; every thing is green; there are a lot of mosquitos. We're expecting a really fine rest of the summer with water levels staying up. The Lander area is fishing well and there are lots of hoppers maturing. We have some open time the end of August and September. Come join Hank on the Bighorn or work your hopper on one of our smaller streams! Well, it has finally turned summer in Wyoming. All our rivers are running full, and ours on the East side of the Wind River Mountains have just started to drop. Reports say snow line West of the divide is at the 9200 foot elevation, and we think a bit higher on the East. If I had my choice I wouldn't start a trip into the Winds until after 15th July, just to be on the safe side. Our local streams should be fishable at that time also. Don't plan on fishing the Wind River in the Dubois area until August. Wind River Canyon has now dropped and Hank reports very good results on the Bighorn at Thermopolis. He has been using mainly streamers and nymphs and reports instantaneous break-offs on 3X! Hank has some time now to guide before our first mountain trips, and after August 20. Jim Ferguson also has some time from August 10 on. A little rain, a bit of snow, throw in a day of bright blue Wyoming sunshine. That's what makes spring really happen! Birds are chit chatting outside our house near Sinks Canyon. It continues to be a cool spring, but the aspens have started to leaf out and we have seen some of our spring flowers. Still you know nothing can stop it now. Sure we get our setbacks, but each week we see the average temperatures go up, we see more birds, the rivers get higher, and all is greener. Yes, this might be a record year for Wyoming. We hear that the average mountain snow-pack for the whole state is 155% of normal. That means many of our rivers will be high for a long time. As of today, they are reporting the Wind River Drainage snow-pack at 143% of normal and the Upper Green at 193%. So don't get in too big a hurry to get in the mountains. Local streams are still fishable, but only for a few days more. The Wind below Boysen is running 2450 cfs and is quite fishable, but might be bumped up when we experience real run-off. The big news is that we have purchased a drift boat and intend to guide on the Bighorn in the Thermopolis area. We have enjoyed fishing over there for years, and Hank is our go-to man. 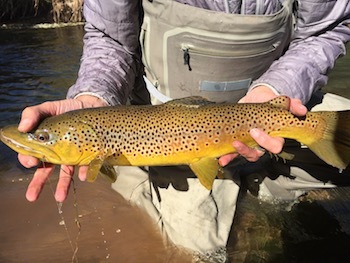 In the fall there can be months, it seems, of small dry fishing--tricos and baetis, not to mention solid nymph and streamer fishing to incredibly healthy rainbows, browns, and even an occasional cutthroat. We hope you might try this with us. Spring in Wyoming! Is it the same every year? It comes on so slowly to be nearly imperceptible. One day it is almost warm and the next it snows. I have seen tell-tale signs, like a few phlox clinging to their clumps on the sunny side hills. I've also noted that the marmots are out near our house and that the bluebirds, meadowlarks, and redwing blackbirds have returned. Lots of climbers out in Sinks Canyon. It must be time to go fishing! Lots of locals out. You know, the cabin fever syndrome after a pretty long winter. Our snow in the Lander area has probably been as little as anywhere in Wyoming--but everywhere is above normal. The snowpack on the Eastern side of the Winds is showing about 115% and the Western side at 130%. That means good news for all our fisheries. I am expecting a normal runoff in late May and June. Those of you who want to go fishing in the high Wind River Mountains, should put off any trips until late June or early July. 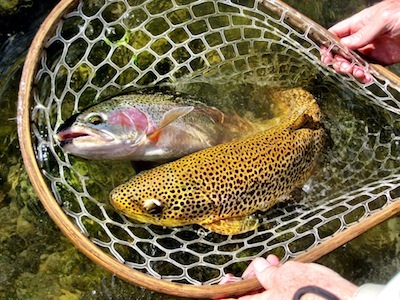 Streams in the Lander area should be dropping and very fishable by early July. The Big Wind in the Dubois area will probably not clear until late July. Right now the Wind in the Canyon is at 1250 CFS and fishing well. The blue winged olives have started to pop, but most anglers I hear of are catching fish on nymphs. I have been out this week in Lander and saw some fish rising to the tiny mayflies. The fish are still in their winter holes. They haven't spread to the shallower water yet, although they can be in the shallow parts of the deep winter pools. Small nymphs worked for me. These small streams have not come up any yet, but as soon as we get some warm weather they will. Not to unfishable levels. As the snow melts here, the water temperatures drop and we see little insect hatching activity. Most fishing will be right on the bottom. We should have a month before the real runoff starts and makes these smaller streams too "pushy" for comfortable drifts. Paula and I have just returned from two weeks in Argentina to find more snow in Wyoming. It is still winter and like most of the West (and the nation for that matter), it has been a real winter. Snow pack in the Winds is somewhat above the average, with all the state running slightly above average to well above average. As we all know, snow means water in our lakes and streams. I get reports that winter fishing has been good in our area when the temperature has permitted (mostly in Wind River Canyon and on the Bighorn at Thermopolis. Hank has been out some with one of the new Orvis Switch rods. He likes it alot! Our trip to Argentina was a great adventure. Neither Paula nor I had ever been there, but of course we had read the stories of Joe Brooks, Ernie Schwiebert, and others, and were glad to go when Paula was asked to help out the Patagonia program for the Nature Conservancy. Conservation in Argentina is in its infancy in some respects. The only "preserved" lands are the national and provincial parks. All other land is private. There is one conservation easement in all of Argentina, and Paula was asked to come and do the first baseline monitoring of it. From Bariloche we made a long drive to the northern end of Neuquen province, where we saw a lot of country that looks like the middle of Wyoming, meaning very dry. After looking over the easement (yes, we were able to catch our first trout here), we wended our way back through large estancias to the south, talking to owners and ranch managers about the idea of conservation easements. The only problem with the idea of these is that there is no real incentive to do them. In Argentina, there are no laws or regulations which make them financially beneficial, as in the USA. And inheritance laws there only lend to fragmentation of the large pieces of land which are essentially pristine and preserved. Anyway it was very interesting. We were escorted by two wonderful Argentines and saw some beautiful estancias, most of which had fly fishing as an integral part of there operation. 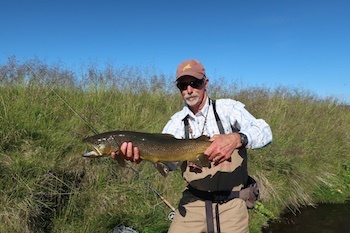 Argentina has a long history of managed fishing and guiding on these large ranches. We were able, from time to time, to enjoy some of the storied waters. Paula and I had another week after her "work." That turned out to be even more adventurous, since we rented a car and toured farther south from Bariloche to the Esquel region. My Spanish consists of a few words and phrases, so getting things across was interesting. We managed to fish some spring creeks and the big Rio Grande which becomes the Futalafu in Chile. All really good looking country. We met lots of wonderful Argentines (and fortunate for us, some spoke English well). Other than great rivers and the Andes themselves, we were impressed with the bird life. Really cool to be fishing among flamingos. We also saw indigenous rheas, guanacos, and armadillos. It's a big country and Patagonia has so few people. You could spend a lifetime just poking around. We're still fishing out here in Wyoming and we really don't want the season to end. Our fall has been one of the longest and mildest on record. The rivers and streams still have sufficient water. The trout are willing and are sometimes even taking the small fall mayflies. What could be better? The year has been one of extremes. It appeared to be a very dry winter with minimal snowpack. Then we got socked with an incredible spring and early summer which increased snow levels (especially in the southern Winds) to as high as 300% of normal. Early summer was cool, but August and September were just perfect summer, with almost no precipitation. Early summer in the mountains was as green as we have ever seen it and with flowers that you wouldn't believe (this was even the case in the lowlands). Bugs (especially mosquitos) were profuse, of course. June 8 saw a record flood in Lander. Local streams in the lowland were too high to fish into early July. Lots of the pools in the streams around town have gotten way deeper, and I can't say this 50 year flood event was in any way bad for fishing. Water in all the small streams held up well to late August and with an amazing hopper year, our fish are in the best shape in years. We didn't get that many days out of the mountains to fish hoppers, but when we did, "you shoulda been there." Hank, and I, and Jim were a little of everywhere in the mountains and all areas had their highlights. Hank and I thought that the July fishing was about as good as we had ever seen it. Numerous times we peered into a pool and saw solid fish backs. You would have thought we were in Alaska! As far as our personal lives, Paula and I just returned from a once in a lifetime trek in the Indian Himalayas. We had the big 30 for Louisa on September 1, and Molly Hunker graduated from UCLA architecture school and now even has a real job! Check her stuff out at www.mollyhunker.com. Jim and Anna Ferguson worked together again this summer. Jim has taken off for Chile and Anna will be joining him for most of the season starting in late December. Jim is working on a building project at his property, "Aguas Azules." Hank and I are just back from our last mountain trip of the season. Jim is still out. The mountains have finally dried out and it has seemed like summer, although we have already had a few frosts. Hank and I found the golden trout fishing tough on the last trip. They just didn't appear to be there (we know they were). Still caught some fish in the 18" range. We saw beautiful country in perfect shape. Hoppers are still heavy in the Lander area and fishing is great! It has cooled off some and water temps should start to drop, which helps the fish and makes them more active in the middle of the day. Come join us this fall. Just back from a week trip. Don't know if I have ever seen the mountains as beautiful. ALL the flowers are out and the bugs aren't as bad as many say. We've had quite a few thunderstorms and I think that has knocked them back a bit. The boletas mushrooms should be coming up soon! Reports around town say the fishing is fantastic! Lots of hoppers and the water levels are staying up! Hank and I just had a cancellation for late August, so now have from the 20th free for day fishing or a mountain trip. Enjoy the rest of the summer. Early season fishing in the high Winds has been utterly spectacular! When you can't even fathom how many fish you caught, that says something. Water levels are still high but dropping and the mosquito levels are impressive. Not, however, of Alaska proportions. Lowland waters are still higher than is optimal, but clear. August should be exceptional. Still look for lots of hoppers. This also speaks well to our fall fishing. Jim, Hank and I still have spots available for September. Jim also has a few days for day fishing throughout the rest of the summer. Don't forget to have fun! The floods are over in Lander! Local rivers peaked on June 8, with considerable flooding in our area, with more of the same in Saratoga and Laramie. Rivers are now down by half, but are still running quite high. I would predict fishable water around July 4. We have finally had a turn toward summer with really pleasant temperatures in the high 70's and low 80's. Everything is really green on the East side of the Winds. Should bode well for a great summer of fishing. Paula has been taking all the precautions for her garden. She is on the warpath over hoppers......looks like it might be one of those years. Time to get out fishing! Well, the rivers are sure flowing full in the Landiego area. And they're likely to come up more. Both Boysen and Yellowtail Dams in the Bighorn drainage are dumping water in anticipation of more. Our snow pack on the east side of the Winds is in the 150% range, and it has risen to over 90% on the Green River side. Flowers are out in force on the flanks of the Winds. Sure does seem like we'll have plenty of water for late in the summer. Anyone going into the mountains should anticipate heavy mosquitos from the middle of July into early August. Wow! Lander had 3.25 inches of moisture in the form of snow and rain and various snotel sites in the mountains measured more than three feet of snow. The Wind River Drainage is now showing a 135% snowpack, and the Green River Drainage is at 73%. The Wind River out of Boysen is flowing at 2300 cfs and most of the drainages in Wyoming (except for the Snake and Yellowstone) are near or above average for their snowpacks now. Yes, again it is spring in Wyoming! Runoff will start in earnest next week when the highs are predicted to be in the 70's. Another snow day in the Wyoming spring! Our spring weather has hardly been consistent. We have had only a few of what I would call a "Wyoming blue sky day." This is reflected in the snow pack on the Wind River side of the Range. Today we are showing a 98% snowpack, with Togwottee Pass coming in at 80% and South Pass at 89%. Many other snotel values are above 100%, with the one right above Lander at the highest for the range at 140%. The Green River side of the range is showing an overall snowpack of 58%. Who snows what it is really like along the Continental Divide? Don't plan on early trips from the East side! Bureau of Reclamation has recently increased the flow of the Wind into Wind River Canyon to 1600 cfs, and Bull Lake Creek is now at 70 cfs. As soon as we get some weather in the 70's our local streams will be experiencing runoff with levels too high to fish pleasantly. Those with dams, as always, will be OK. Most people have been reporting quite good fishing in the Lander area, with even a few fish on caddis and March brown dries. The bluebirds are starting to nest and we even have reports of a few hummingbirds (the'll be cold today!). Not many flowers, other than a scattering of buttercups, have come up along the slopers of the Winds. Kind weather in the 50's and 60's and lack of wind will bring everyone, including the bike riders, out. What a difference a month makes in Wyoming! We went from a cold and snowy winter to a cold and snowy spring! The West side of the Winds is showing a 62% snowpack, where our side (the East) is now showing 97%. Much of that is on the southern end. Imagine that! Fortunately, Paula and I were in the Bahamas when most of that snow fell. Hank has been fishing locally and reports excellent results. The Wind (Bighorn) River is flowing at 700 cfs and is very fishable in Wind River Canyon and below at Thermopolis. The locals are going crazy for some real spring and we do notice the signs--bluebirds, marmots, and prarie dogs are certainly around. The grass will certainly be green when it warms up. Jim Ferguson has returned from another winter in Chile and reports it was one of the best ever. He did some scouting on a new river which seemed perfect after perusing his photos. Happy Spring! Hank Hunker has just returned from the Bahamas after plenty of fishing adventures. See his bonefishing video. We could all use a little of this after a long, cold winter here in Wyoming. Snowpack levels are light in the Wind River Range. Most values are in the 50 to 60% range, except in the Lander area which is in the 70% range. Without wopping big spring moisture, we can anticipate low water levels in August and maybe fewer mosquitos in the mountains in July. After an above normal spring snowfall, we continued with a wet and cool early summer, producing profuse flowers and mosquitos. August was a bit drier but also cool, which led to a September which was dry and more like August should have been. We really didn't have a significant snowfall in all of September. Then October hit and found us with major snows and the streams in the low country running more full than anytime in recent history. Lander has recorded almost four more inches of precipitation than is normal for this time of year. Fishing was quite good wherever Hank, Jim, and I went. We got quite a few last minute bookings for mountain trips, which Jim took care of. We did very little guided fishing in the lowlands around Lander due to our busy schedules in the mountains. And that is way too bad because there was an incredible hopper hatch and the old browns were really on the take. We heard tons of great hopper stories. When we did slow down in September, it lived up to the billing. 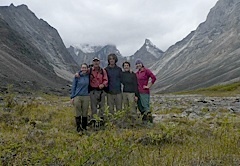 The Hunker family including Paula and all three children (Louisa 28, Molly 26, and Hank 24) took off for Alaska the last two weeks of August and had a wonderful eleven day backpack adventure in the Arrigetch Peaks, Gates of the Arctic National Park, part of the Brooks Range. It wasn't exactly a fishing expedition, but it was an awesome escapade, especially considering the years of wear and tear on Paula and myself. It has been a typical fall with fine weather interspersed with snow storms. We have managed to fish a bunch locally especially the little mayflies on the Bighorn at Thermopolis. It is so fun to work at catching big slurping pigs on tiny dry flies! Hank has been working the nymphs locally. The favorite is a tiny Hare's Ear with a pink chenille thorax (I think it could resemble a nymph with a whitefish egg in it's mouth). He tells me of the numerous twenty inch browns and rainbows he lands. Jim Ferguson has again headed down to Chile for the winter. This year he has left his niece Anna Ferguson in charge of his house in Lander. He and Anna did all their mountain trips together, and they have made a good team.This was Anna's second season working with Jim. Anna has grown up in Sweden and this is her first year away from home and on her own. It is springtime in Wyoming, and you know what that means. Yes, it is more like winter than spring. In early April we have now had five snowstorms in about two weeks (all concentrating on the Lander end of the Wind Rivers). Our snowpack was very thin through the winter, but now the eastern side of the Winds is almost all slightly above normal. The only exception is the Sweetwater Drainage which is now about 80%. The Green River side of the Winds is also sitting around 100%. What does this mean? It means a late spring in the mountains.....don't think about trips until very late June or early July (especially up to timberline). This also bodes well for our small streams like the branches of the Popo Agie. I am looking for our highest runoff in late May or early June and for local streams to be in fishable condition by late June.We are very pleased to see two seasons in a row with adequate water. This is particularly beneficial to our small streams, which suffered heavily through eight years of drought. Dam releases on the upper Bighorn (around Thermopolis) should be good. The Wind River will have plenty of water in it and will be dirty from now until probably late July. For those of you who love to peruse this website for our secrets, here it is! What do you think of this golden caught by Hank Hunker this summer in the Winds? Needless to say we had a great summer. There was an incredible snowpack which made trips, even in late June, problamatic. It did make for a beautiful season and lots of adventure. We had flowers and mosquitos your wouldn't believe. Hank and I were particularly busy and we only went to the same place twice. We did a 12 day trip with llamas that we hadn't done before and was particularly adventure-filled (like swimming 10 llamas across a large river).Overall it was a cool, dry summer. The fishing held up well, although we did have some smoke from fires late in the season. We managed a short snowstorm on the 15th of August. We didn't fish much in the Lander area until the fall. Streams in our area didn't really get fishable until mid-July and steadily fell until September. It was a cool summer in the valley too, with no days in the 100's. Streams fell low enough that it was very helpful for trout to have these cooler temperatures. Fall fishing has been quite good when we don't fish one spot too heavily. We have seen lots of nice browns. 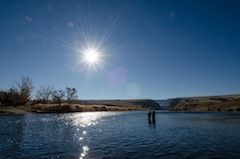 The Bighorn at Thermop has had it's fine fall trico and baetis fishing, which will continue into November. October 12 saw a snowfall of about 2 feet which will bring our waters a "fresh" which will serve them well through the winter. I've been enjoying tying on a soft hackle on almost every rig I use, including tiny trico and baetis. If you haven't used a soft hackle, tie one on above your first knot (just using a short piece of tippet and tying it direct to the leader with a clinch knot). You'll be surprised how many fish take the soft hackle. Have you seen Hank's video on Bonefishing in the Bahamas? March,2010. A profile of George appeared on the Audubon Wyoming website, 2010. Check out the article about us in the "April 2006 Angling Report" on one of our 2005 trips. The whole Hunker Clan on top of the Winds.